Best of all, this giveaway is open to ALL of my readers – national and international alike! Woohoo! Because I had so many new NuNaturals products to try (in this one I use their luscious Peppermint Stevia liquid), I decided to stretch the giveaway out one more day so that I could give you two recipes. Check back on Monday for some gluten-, oil-, and sugar-free Chai Chocolate Chocolate Chip Cookies that features NuNatural products NuStevia Reb99 and Oat Fiber. Fun Fact: Have you ever overheated chocolate and had it seize up like my back after I pick up Ikey (our dog)? Depressing, isn’t it? All is not lost however – you can usually bring it back from the brink. Who wants to throw away chocolate? Here’s what you do: Add a little bit of melted coconut (or other mild) oil to the chocolate and whisk until smooth. In a high-speed blender, combine the tofu, cashews, non-dairy milk, spinach, mint, peppermint liquid stevia, lemon juice, and matcha powder and process until silky and smooth. Divide about half of the mixture between four small bowls or glasses. Refrigerate for 15-30 minutes. Gently melt the chocolate chips in a double boiler or in the microwave. Scrape the melted chocolate into the blender and process until very smooth. Scrape down the sides of the blender once or twice. Pour the mixture over the mint pudding in the bowls/glasses and chill until firm. Serve garnished with fresh mint leaves. This recipe shared on Healthy Vegan Fridays and Virtual Vegan Linky Potluck! REMEMBER, this giveaway is open to the whole wide world! Giveaway ends at midnight U.S. Central time on March 13. Thank you! So you’ve got a good handle on stevia – – you’ll love these flavored ones, I’m sure! Huzzah! I’m so excited – no-one usually has giveaways for us poor sods outside of the US 😀 I’ve never actually used stevia before, simply because it is too expensive – our import costs are bombastic and saddening. I see so many recipes that require it though, and it seems a great alternative to traditional refined sugar (which I only include in maybe one recipe out of 20, if that). Sometimes one simply can’t replace ingredients such as a cup of soaked dates in place of the sweetness of something like stevia, because you don’t actually want/need the physical bulk of the dates, for example. Also, that mint pudding is tempting me sorely – so many recipes lately have mint in it – I’ll just have to whip out some extract and go wild! I know, right?! I always feel like a heel when I have to exclude overseas folks. Another reason to love NuNaturals! Yay!!! You’re going to have so much fun! I’ve never used stevia but I would love to have a go at making these delicious looking concoctions, they look so appetising. 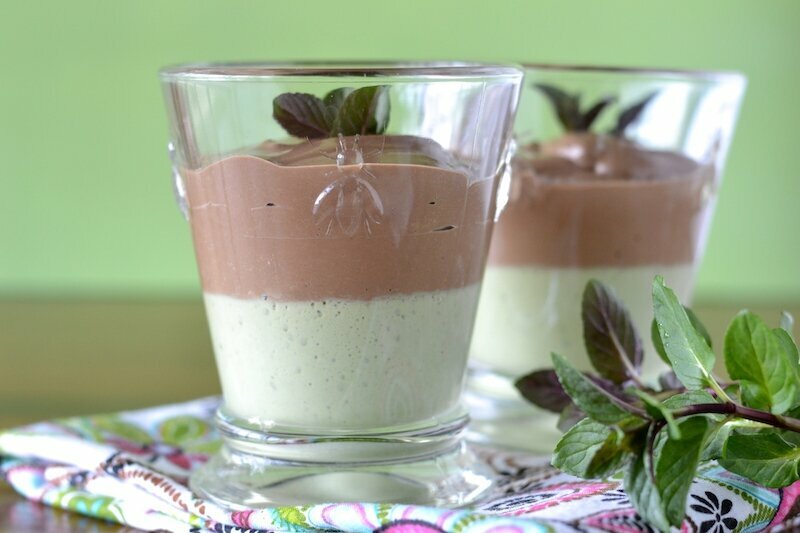 This pudding was a real hit with Kel – but really, chocolate and mint? No brainer. I’m so glad to be able to include my overseas friends!! Oh, you’ve got to try it! I love the stuff – – but you’ve got to be careful about the brand. Many of them leave a not so pleasant aftertaste. This is why I love NuNaturals – no funky flavor. Thanks for entering the giveaway, Ali! NuNaturals really are the best aren’t they?! I’ve only used the vanilla and plain liquid stevia but can’t wait to try the other flavours! I love ’em!! I think their other flavors are relatively new. One of my favorites is their cherry-flavored liquid. Fingers crossed for you on this giveaway ;-)! Looks delicious Annie… Love the double layer! Can’t wait to see those chocolate cookies with oat fiber!! I think you’ll really like NuNaturals. One of the issues with many stevias is that weird taste you get. I haven’t notice that with these products and I absolutely love their flavored liquids. Incredible. Yay, giveaways! I use stevia to sweeten my teas, and to liven up fresh fruit when it needs extra sweetness. Yay, indeed! I haven’t tried stevia on fruit – – great idea! 🙂 Thanks for your support – always nice to “meet” the (awesome) folks who follow the blog! I think the flavors are relatively new and I’m happy to be the tester :-). I have never tried stevia products so far. I subscribe your posts. This would be a great way for you to try them! Thanks for entering (and subscribing)! Ah, stevia in water! I’m learning all kinds of things today! Thanks for entering the giveaway! You’ll love the other flavors! Thanks for entering the giveaway, Nicole! We use stevia and actually grow our own in the spring/summer months so we have plenty left over for winter! 🙂 Hope I win! I haven’t tried growing it yet – got to do that! Thanks so much, Suzanne! I adore stevia–I think it tastes better than sugar and I use it in everything, from tea to baked goods to adding a touch of sweetness to savory sauces. I love the fact that it is a sustainable crop, and a great alternative to even other natural sweeteners, which are good viable ethical alternatives to sugar but still seem to put my body into craving overdrive. NuNaturals is one of my favorites–never tried the flavored ones though so I’d be very curious to do so. I really like them. They have a strong, pure flavor, but you get the sweetness, too. Really great products. Thanks, Deb! I must admit that I am not a strong stevia fan. I’ve tried it once and the bitter after taste reminded me of other, not so nice, sugar substitutes. I realize there are some brands of stevia that are supposed to be more pure, less refined, that don’t have the bitter after taste, but I’m not willing to spend my money on a big question mark. This recipe, though, looks fabulous. I might reconsider using stevia for this. I definitely recommend NuNaturals over other brands. I know exactly “that taste” you are talking about. It’s almost like aspartame or something. I haven’t had that issue w/ these products. At any rate, you could certainly make this pudding using your favorite sweetener. Thanks, Laura! I’ve used stevia products, but just the plain stuff. I’d love a chance to try the flavored options! They’re amazing! Thanks for entering the giveaway, Melissa! Yes, I use Stevia to sweeten my oatmeal and other foods, but I’ve never baked with it. Now’s your chance! Thanks for entering the giveaway, Lydia! I’m new to stevia products but would love to try them out! Hey, Julie! Thanks for entering the giveaway! I use stevia in some baking recipes! That’s how I use it primarily, too – – and in my tea. Thanks, Hannah! I think that has possibilities as my next nickname. I know!!!!!! I couldn’t believe it!